The Syrian crisis is the largest humanitarian crisis in the world today. Over 200,000 people have been killed and over half of all Syrians have been forced to abandon their homes. Over 7.5 million people are displaced within Syria and four million have fled to neighbouring lands in Lebanon, Turkey, Iraq and Jordan. In total, 12 million people are in desperate need of humanitarian assistance. The United Nations calls it “the worst humanitarian crisis of our time”. Recent freezing winter conditions have made vulnerable families ever more at risk, particular children, the elderly and people with disabilities. a political solution respecting human rights. Amongst others in the international community, many Anglican and ecumenical agencies are involved in the humanitarian response, through their ACT Alliance sister agency, the International Orthodox Christian Charities (IOCC), to reach people with food, bedding, water clothes, shelter, healthcare and education. PWRDF has also responded to the needs of Syrians affected by the conflict as part of Canadian Foodgrains Bank’s (CFGB) $4 million response which provides food for some 55,000 displaced people and refugees in Syria, Lebanon and Jordan each month. 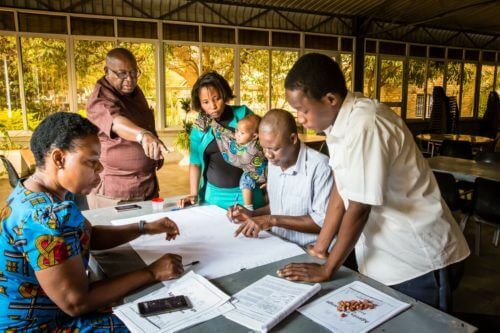 To date they have reached over two million vulnerable people working often in the most volatile areas. Episcopal Relief & Development (USA) is responding through the Fellowship of Middle East Evangelical Churches’ (FMEEC) relief efforts in Syria. The Jerusalem and Middle East Church Association are supporting refugees in Amman, Jordan. PWRDF has also written to the Canadian government out of a growing concern over the plight of Syrian refugees. Christian Aid’s partners in Lebanon, Iraq and Syria are working to provide vital assistance to thousands of displaced families by distributing food, fuel for cooking, hygiene and sanitation kits, water containers, cash assistance and psychosocial support. Us (formerly USPG), through their Rapid Response Syria appeal, are supporting an education programme, run in partnership with Embrace Middle East, for children whose families have fled the turmoil in Syria. As the Anglican Alliance we ask that we all come together to pray and act for peace in Syria and for humanitarian support to its suffering peoples. Please sign the petition at www.withsyria.com and support the appeals linked above. 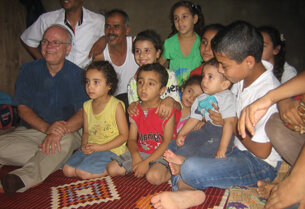 Picture: Jim Cornelius with Syrian refugee children in Shabrieh Lebanon. Credit: Joan Barkman, CFGB, and PWRDF.